Jonathon Clark, Sophia Allem, Luca Palermo, Lily Simmer, and Olivia Kuchinsky with their donations. 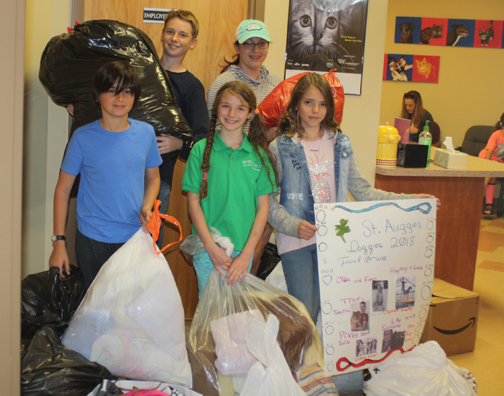 SAINT AUGUSTINE – Auggie’s Doggies 4-H Club has donated seven very full garbage bags of towels and blankets along with a couple cases of food to the St. Johns County Pet Center. Over the course of two months, club members spread the word about the Pet Center’s need for towels and their friends and family answered. The bags filled the back of a pick-up truck and the lobby entrance of the Pet Center. As part of the trip, the 4-H’ers got a tour of the dog and cat kennels. Not surprisingly, they spent more time getting to know the dogs than touring the cat area. The tour finished with the pig and chickens out back. Everyone, including the adults, learned a lot about the Center and how well the animals are cared for. The 4-H’ers walked away talking about how many pets are without forever homes, waiting to be adopted. 4-H programming offers educational opportunities in science, technology, engineering and math (STEM) to youth ages 5-18. The educational experiences in animal science promote life skills to curious youth. In St. Johns County, there are clubs devoted to livestock, rabbits, horses, and of course, dogs. The project-focused clubs use hands-on learning in these animal science subject areas. 4-H clubs are led by trained volunteers committed to creating opportunities for youth to develop life skills while learning about the responsibility involved in raising healthy animals. Youth have the chance to develop life skills including communication, teamwork, personal responsibility, critical thinking and goal setting. The evidence-based curriculum used in the clubs has been developed by land grant universities from around the country. Enrollment for the 4-H Youth Development Program takes place each September and is for youth ages 5-18, as of September 1st. Club enrollment opens in September with clubs completing their activities in May. Anyone interested in learning more about the St. Johns County 4-H program may do so by going to http://stjohns.ifas.ufl.edu/4-H.shtml . Caring adults interested in working with youth should contact the St. Johns County 4-H Office (904 209-0430) to learn of the many volunteer opportunities within the 4-H Youth Development Program.